Following a recommendation of the African Development Bank (AfDB), the African Reinsurance Corporation (Africa Re) was established on 24 February, 1976 in Yaounde, Cameroon. An international Agreement was signed by the Plenipotentiaries of 36 member States of the Organization of African Unity (OAU) and the AfDB with the aim of reducing the outflow of foreign exchange from the continent by retaining a substantial proportion of the reinsurance premiums generated therein. That Agreement, known and referred to as the Agreement Establishing the African Reinsurance Corporation confers on Africa Re its current status as well as the legal authority to operate. As at 2017, Africa Re has 41 member States representing 33.59 % of the capital in addition to the AfDB, which is among the single largest shareholders with 8.17% of the capital, 111 African insurance and reinsurance companies with 32.85% of the shareholding and non-regional investors with 22.91% of the equity. 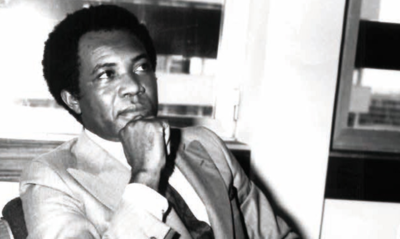 "Mr. Mensah instilled a sense of prudence, confidence and tenacity in his loyal staff." The Agreement also empowers any member State to authorize a national institution, either a bank or an insurance company acting on its behalf, to purchase the shares reserved for the State. In order to allow its cedants to share the Corporation's fortune and participate more closely in its affairs, one-third of Africa Re's capital was opened up in 1992 to insurance companies with a majority indigenous shareholding. A good number of companies subscribed and paid up for shares allotted to them. To date, more than 100 insurance and reinsurance companies are shareholders of Africa Re with a 32.85 % combined stake (2017). "At that time, there were almost zero insurance professionals and virtually non-existent reinsurance industry in Africa." 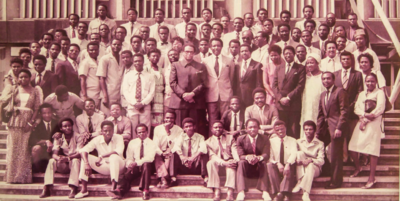 Africa Re staff during the send forth of Mr. Edward Mensah in 1984, Lagos, Nigeria. In line with the decision to allow companies and non-African DFIs to participate in the Corporation's capital, it was decided that the Board of Directors be enlarged to allow representatives of insurance / reinsurance companies and DFIs to occupy majority of seats therein. In 2010, Africa Re called the 4th Capital Increase to bring its paid-up capital to US$ 300 million and its shareholders funds to US$ 600 million by end of 2012. IRB-Brasil Re, the leading reinsurance company in Brazil became a shareholder of Africa Re in 2012. The Corporation had two new shareholders in 2015 namely, AXA – the leading French and global insurer and FAIRFAX - a Toronto based holding and group of insurance and reinsurance companies with subsidiaries around the globe. Africa Re began in Yaounde, Republic of Cameroon. Mr. Edward Mensah appointed as the CEO. Operations began in Accra, Ghana and moved to Lagos, Nigeria later that year. Regional Office established in Casablanca, Morocco. Regional Office established in Nairobi, Kenya. Mr. Eyessus Zafu appointed as the second CEO. Regional Office established in Abidjan, Côte d’Ivoire. Mr. Bakary Kamara appointed as the third CEO. Contact Office established in Johannesburg, South Africa. First domestic rating in South Africa by Fitch IBCA. Contact Office established in Ebene, Mauritius. Upgraded to a Regional Office in 2003. First international rating by Standard & Poor’s. Africa Re built a new corporate headquarters in Lagos, Nigeria. International agency A. M. Best rated Africa Re A- with Stable Outlook. Regional Office established in Cairo, Egypt. Africa Re South Africa (ARCSA), established as a subsidiary in Johannesburg. Africa Re is rated, for the first time, by International agency Standard & Poor’s: A- with Stable Outlook. Mr. Corneille Karekezi appointed as the fourth CEO. Contact office established in Addis Ababa, Ethiopia. Standard & Poor’s ranked Africa Re in its list of top 40 Global Reinsurance Groups. Africa Re was granted a licence to operate in Brazil as an occasional reinsurer. A. M. Best revised the financial rating of Africa Re from A- Stable outlook to A- Positive outlook. Africa Re unveiled its new corporate logo which portrays a world class corporation, ably equipped for the challenges ahead. A. M. Best upgraded the financial ratings of Africa Re from A- Excellent to A Excellent and Stable outlook.